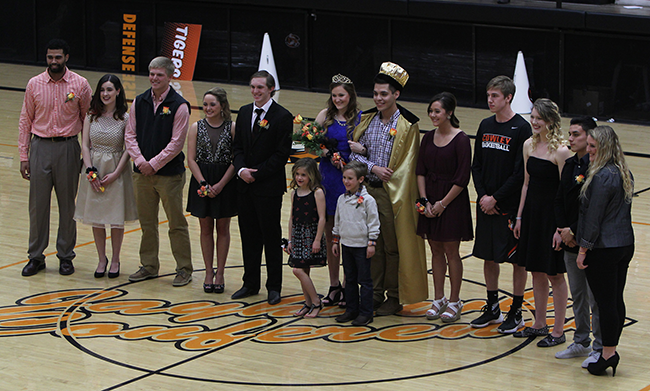 A pair of well-liked sophomores, Arnoldo Ruiz and Logan Morrow, were crowned Cowley College’s Homecoming king and queen during halftime of the Tiger men’s basketball game vs. Coffeyville Community College Wednesday night at W.S. Scott Auditorium. Ruiz is the son of Arnoldo Ruiz Sr. and Leticia Sapien and is a social work major. At Cowley, he is involved in the CAAT program and is an officer for the Phi Theta Kappa Honors Society. He plans to transfer to Kansas State University and pursue a master’s degree in clinical social work. His goal is to practice psychotherapy. Morrow is the daughter of Brian and Jill Morrow and is a pre-nursing major. At Cowley, she was named a Second Team All-Conference performer while helping the Lady Tiger volleyball team place sixth at the NJCAA Division II National Championships. She is also a member of the President’s Honor Roll and plans to continue playing volleyball at a four-year school. 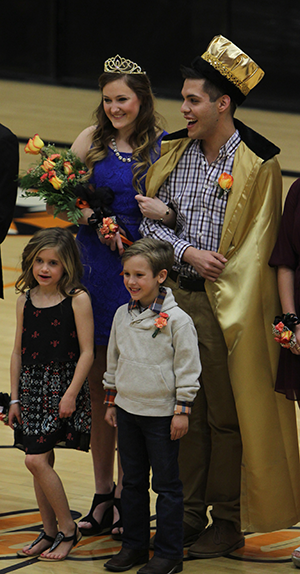 Gavin Brown, Central Dorm Manager and intramural coordinator, and Student Senate Vice President Madeline Pegorsch, were on hand to crown the new king and queen. Danica Duncan, daughter of Jayden and Staci Duncan, and Wyatt Paton, son of Andrew and Melissa Paton, handled the duties of the crown bearers. Queen finalists were, Amy Austin, Morgan Hack, Logan Morrow, Maranda Oak, and Elizabeth Vishnefske. King finalists were, Bryce Fischer, Jonathan Lane, Mason Loewen, Arnoldo Ruiz, and Alex Salinas.